Yamaha YDP-163 review: This or the YDP-143? Which one to choose? Just a week ago I did a review of the YDP-143, a mid-range digital piano from the Arius family. 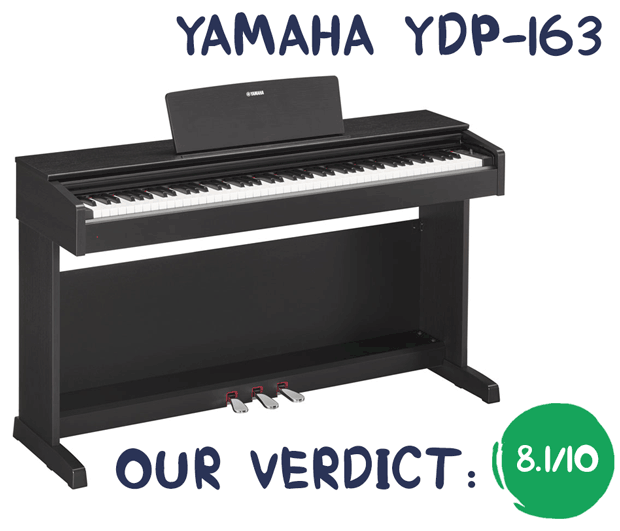 And today it’s time to take a good look at its bigger brother, the Yamaha YDP-163 , the next model up in the Arius line. There is a lot of talk about whether it’s worth spending extra money on the YDP-163, considering it’s quite similar to the YDP-143 model. So in today’s review, we’re going to talk about all the differences between these two instruments and will try to figure out which one would be a better choice YOU. I’m not going to talk about the YDP-163’s sounds and features because I’ve already covered all that in the YDP-143 review. In this review, I’m only going to touch on things that are different in the YDP-163 compared to the YDP-143 and will also talk about possible alternatives. The YDP-143 and the YDP-163 are not very different when it comes to design and look almost identical. Both pianos are housed in an elegant wooden cabinet and come with a Yamaha bench. Due to its upgraded keyboard, the YDP-163 has a slightly bigger (higher) keyboard base (33.4” vs 32“). It’s also 9 pounds heavier than the YDP-143 but is not really noticeable in real life. Just like its smaller brother, the YDP-163 is available in two finishes: Dark Rosewood and Black Walnut. In the UK & Europe, there’re two additional colors available. One is White (YDP-163 WH), and the other one is called White Ash (YDP-163 WA). To me, it’s kind of strange that Yamaha has decided to limit the color options in the US as it’s always a good thing to have various colors to choose from. With that said, Dark Rosewood and Black Walnut are pretty universal colors that will blend well into any home decor, so it shouldn’t be a problem. That’s pretty much it when it comes to differences between the YDP-143 and YDP-163 in this department. The YDP-163’s most important upgrade over the YDP-143 is the keyboard itself. And this is the first thing you should consider when trying to decide between these two instruments. 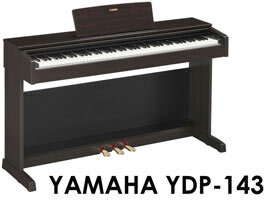 The YDP-143 features Yamaha’s most affordable fully-weighted keyboard called the Graded Hammer Standard (GHS). The YDP-163, on the other hand, has a more advanced keyboard called the Graded Hammer 3 (GH3), which is also found in the P-255, YDP-S52 , and some other models. Both keyboards have a full set of 88 graded touch-sensitive keys that use spring-less technology. In my opinion, the GH3 outperforms the GHS in all the main aspects. But as I always say, keyboard actions are pretty hard to evaluate and compare to each other objectively . People have different tastes and preferences. Some players like a heavier touch on the keys, others prefer lighter hammer actions. So it’s always a good thing to try and compare all digital pianos on your list in person. As for me, the GH3 feels heavier and somewhat more solid than the GHS. I’ve heard people saying that they actually like the GHS more than the GH3, finding the GH3 somewhat stiff and hard to play. And for some players, especially beginners, it indeed might be the case. The GH3 is certainly on the heavy side, and to me, it seemed even heavier than some of the acoustic piano actions that I’ve played. But key weighting is actually the reason why I like the GH3 and prefer it over the GHS. To my fingers, it feels and plays much more realistic and acoustic-like than the GHS, even though for some it might seem a bit too heavy. The GH3 uses a 3-sensor key system (the GHS has a 2-sensor system) that sequentially detects positions of the keys and allows for more accuracy and faster note repetition. The difference is especially noticeable when you play fast passages and trills. Another thing that contributes to the authentic playing experience is ivory-feel keytops. 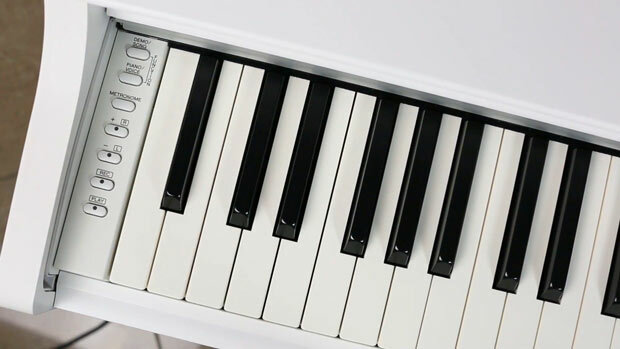 The GH3 keyboard uses special material designed to simulate real ivory surface. It features moisture-absorbing qualities and provides a positive grip even when our fingers become moist after long playing sessions. And overall Ivory keytops feel nicer to the touch than regular plastic keys. Speaker system is the second most important difference between the YDP-143 and YDP-163 models. Both pianos have two oval (12cm x 6cm) speakers, but the YDP-163 has 40W of output power (20W per channel), while the YDP-143 has only 12W of power. While this might seem like a huge difference on paper, it’s not that noticeable in real life. Both pianos sound very decent and can produce enough volume to fill small to medium size rooms and even to bother your neighbors a little bit. With that said, thanks to more powerful speakers, the YDP-163 does sound a little bit deeper and fuller, which is especially noticeable in the bass register. Treble notes also sound a bit clearer and have a more crispiness to them. Overall I was satisfied with how both instruments sounded, so I don’t think speakers are a real deal-breaker in this case. Since the YDP-163 is a console digital piano, there are actually not many accessories you’d need to buy separately. For example, you don’t need to spend extra money on a stand or pedals because they already come with the piano. 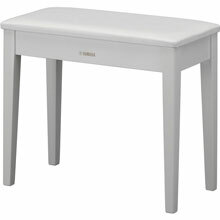 The Yamaha BC-108 bench is also included, so you don’t have to worry about that either. What you’ll still want to buy separately is headphones, especially if you prefer to practice in private or simply want to experience a more immersive and higher-quality sound. As you can see the difference between the YDP-143 and YDP-163 models isn’t that huge. And the first thing that comes to your mind is probably whether paying an extra $300 for the YDP-163 would be justified. Well, it depends on several things. 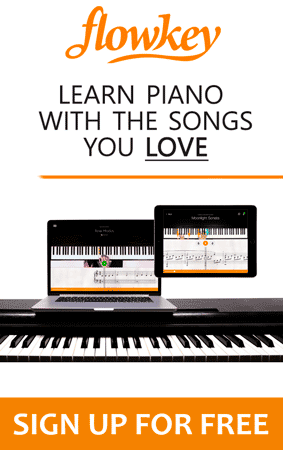 First off, both models are fairly good digital pianos suitable for a wide range of players starting with complete beginners and ending with accomplished pianists. Likewise, if you’re looking for a family piano with an elegant design that will not only serve as a musical instrument for practice but will also be a beautiful piece of furniture in your home, you’ll not be disappointed with either of these instruments. To be honest, if you’re just starting out, I don’t think that paying an extra $300 for the YDP-163 is an absolute necessity, especially if you have a tight budget and don’t know if you’re going to stick with piano playing for long. On the other hand, if you’re not a beginner and have already acquired some basic skills and knowledge, I definitely recommend taking a look at the YDP-163 . Its upgraded keyboard feels and behaves much more like a real piano keyboard and gives you more room to sharpen your finger technique and to grow as a musician. There currently a number of good digital pianos on the market that can compete with the Yamaha YDP-163 in terms of piano playing authenticity. Korg pleasantly surprised me with their latest home digital pianos presented in 2017. I wasn’t a big fan of Korg’s digital pianos but after trying out their new C1 Air and G1 Air models, I was really impressed with how good they turned out to be. The G1 Air is a flagship model in Korg’s arsenal of home pianos and it really is a great instrument in every way. First of all, it looks fantastic. I really like the curved lines and legs it has. At the same time, it’s slim and requires very little floor space. The G1 is equipped with the Real Weighted Hammer Action 3 (RH3), which uses a 3-sensor key detection system but, unfortunately, doesn’t have synthetic ivory keytops. The keyboard seemed a bit lighter than Yamaha’s GH3, but also quicker and more responsive. The RH3 is a pretty well-known keyboard action that Korg uses in their professional keyboards, and I’ve only had positive experiences with it so far. What I like about the G1 is that it comes with 3 really good piano sounds. They’re sampled from German, Austrian, and Japanese Concert Grand Pianos, and include organic elements like string resonance and key off simulation, which the YDP-163 doesn’t offer. Aside from that, there are 29 other instrument sounds, including electric pianos, organs, guitars, strings, etc. The sound is delivered by powerful 4-speaker (80W) sound system, which is quite impressive for an instrument in this price range. Among other features are a 2-track MIDI recorder, 40 preset piano songs, dedicated Line Out jacks, MIDI In/Out ports, USB port, and two headphone jacks. Moreover, there are 9 types of temperaments to choose from (YDP-163 doesn’t have this option), and 5 preset types of touch-sensitivity (YDP-163: 3 types). The polyphony is a bit lower compared to the YDP-163 (120 vs 192), but it’s still more than enough for piano playing and some basic layering. 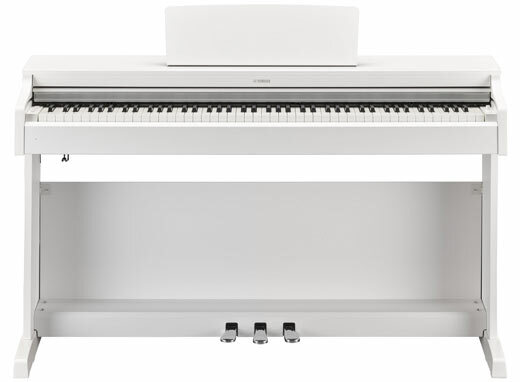 “Air” in the model name means that piano supports Bluetooth (A2DP Sink), which allows you to play audio files on your phone/tablet through the piano’s speakers wirelessly (note that MIDI data cannot be transferred via Bluetooth). Being about $100 cheaper than the YDP-163, the Korg G1 is a worthy competitor to the Yamaha, and even outperforms it in some aspects (connectivity, sound options, speakers). Moreover, if you like a slim modern design of the G1 with a variety of color options, definitely check this instrument out. It’s a beast. 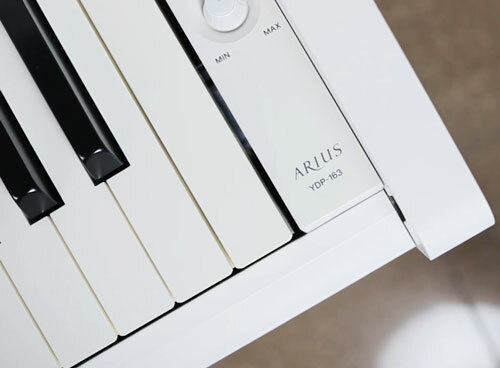 The is yet another digital piano in the Arius line. When it comes to sounds and features, the YDP-S52 is completely identical to the YDP-163 but housed in a more compact modern-looking cabinet. “S” in the model name stands for Slim. The pianos share the same sound engine (Pure CF), same keyboard (GH3 with synthetic ivory surfaces), 2 x 20W speakers, 10 built-in tones, 2-track MIDI recorder, etc. So yes, these are pretty much the same pianos. Keep in mind that the YDP-S52 is about $150 cheaper than the YDP-163, so if you like its design more or if design is not really a key factor for you, it would be a more cost-efficient choice. Plus, the YDP-S52 is about 4 inches slimmer than the YDP-163, making it more accessible for placing in smaller spaces. 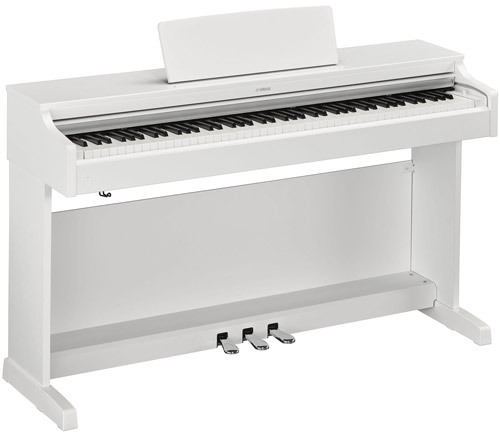 Another thing I want to mention is that the YDP-S52 is available in White Walnut finish, which for some might be an important buying factor, especially if you are looking specifically for a white digital piano. Kawai has definitely raised the bar with their newly released KDP110 digital, which replaces the hugely successful KDP90 model. Kawai is known for making one of the most realistic keyboards on the market, and all their digital pianos, including the entry-level ones, have amazing keyboard actions. 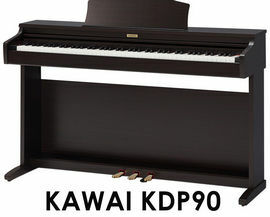 The KDP110 , which is Kawai most affordable console digital piano, proves it one more time. 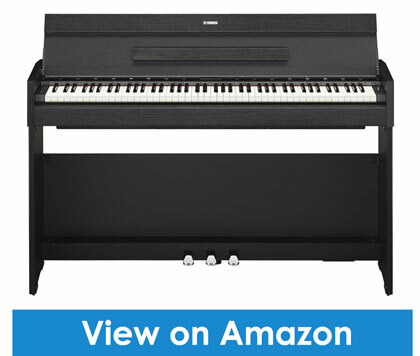 The piano features the new Responsive Hammer Compact II keyboard action, which, in my opinion, is one of the best key actions in terms of realism and accuracy at this price point. Just like Yamaha’s GH3, it uses 3-sensor mechanism and has simulated ivory keytops. The upgraded Harmonic Imaging sound engine offers a brand new sound of the magnificent Shigeru Kawai SK-EX concert grand, which received universal acclaim from professional pianists all over the world. 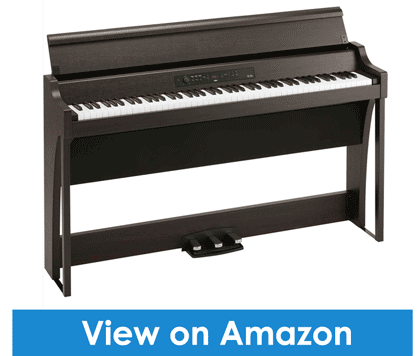 Another unique feature of the KDP110 that no other piano in this price range offers is Virtual Technician. The VT allows you to adjust 13 parameters of the piano sound and touch to fully customize it to your needs. Some of the parameters are touch curve, key-off effect, hammer delay, decay time, topboard simulation, temperament, stretch tuning, half-pedal adjust, etc. Similar to the Yamaha, the KDP110 has 192-note polyphony, 6 reverb types, and 40W speaker system. 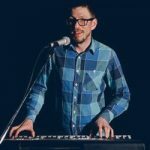 You’ll also be able to record your performances using a built-in MIDI recorder and practice hundreds of songs using a Lesson function. The KDP110 offers 40 Concert Magic songs and 5 built-in song books with various exercises and pieces from Czerny, Burgmüller, Beyer, etc. The KDP110 offers a variety of connectivity options. To exchange MIDI data with your computer or smart device you can use any of three interfaces available on the piano. There are traditional MIDI In/Out ports, USB type B port, and Bluetooth connectivity, which will allow you to transfer MIDI data to other devices wirelessly. All in all, I don’t think that anything on the market can quite match what the KDP110 offers for the price. First of all, I’m talking about its very natural key action, and piano sound that is a real joy to listen to. Add to this the Virtual Technician feature and all the other features that come with the piano, and the KDP110 becomes almost unbeatable in its price range. Great reviews! 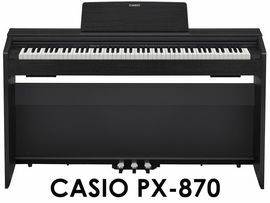 I realize I’m mixing price ranges here, but how do you feel the Casio PX-870 stacks up in terms of key action realism vs. these higher priced ones? 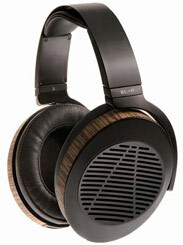 I’m trying to decide if going for something in the YDP163/KDP110 range is worth the extra $$. 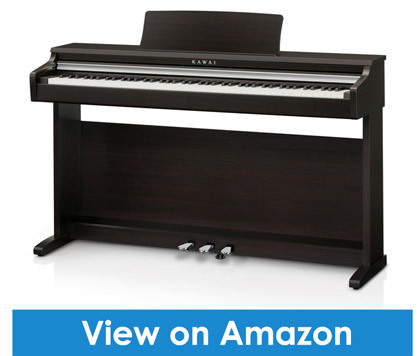 I’ve been playing piano for a couple years now, and I’m struggling with my semi-weighted keyboard to transition when I play on a real upright or grand, and hoping to bridge that gap as much as possible for my practicing (while staying < $1,500 at the absolute max and having a silent option). Appreciate the passion you put into this! Hey Brian, it may or may not worth paying the extra money for the YDP163 or KDP110. It all really depends on your personal taste. While the YDP-163 has the best action out of the three (in my opinion), it’s also considerably more expensive, and I’m not fully convinced that paying the extra $300-400 for the YDP-163 is worth it. Sound-wise all three are pretty good and provide relatively the same level of realism. But since you want to transition from an upright to a digital as smoothly as possible, the YDP-163 might still be a good choice for you. Out of these three actions, the GH3 (YDP-163) is probably the heaviest, then goes the Tri-sensor Scaled Hammer Action II (PX-870), and the RHCII (KDP110) is the lightest one. While the difference isn’t that big and any of these would be good for developing proper finger strength and technique, the action of the YDP-163 will be a bit closer to the action of a real acoustic piano (though not all acoustic piano actions are created equal) than the other two. Thank you not only for this review, but for all of the other comprehensive articles and content you fine folks provide. I walked into the piano store wanting the YDP-143 (based on another article on your site – five best digital pianos under $1000 for home use) but ended up buying the YDP-163. I saw that one of the cons in this article was the lack of string resonance but Yamaha has a feature called “damper resonance” which, from the way they describe it, seems like the same thing. My thoughts are as follows: If you think you will be keeping the instrument for some time and progressing beyond the beginner range, the extra money for the 163 vs the 143 is well-spent. Too many times in my life have I purchased one level down only to regret it and eventually spending double to get what I really wanted. Hi Frank, thanks for sharing your impressions, comments such as yours are very useful for the community. It helps people decide what’s the right instrument for them. I’m with you on all the points, except for string resonance in the YDP-163. By “string resonance” I mean the phenomenon occurring when harmonically related notes resonate in sympathy with the notes being played. It’s different from the damper resonance, which occurs when you depress the sustain pedal allowing the strings to vibrate freely. Pretty much all digital pianos will have damper resonance. String resonance is usually reproduced in higher-end digital pianos, though these days we see more budget pianos that have this feature as well. 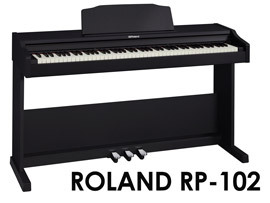 I’d probably go with Roland, it’s got the best value ratio, but my wife simply doesn’t want a black piano. Casio looks great but I’m worried about you saying it’s got the softest keyboard action. So I’m left with Yamaha, which as you say probably has the worst value ratio, but altogether it still is a great piano. About the Yamaha – is there really a noticable difference compared to the better sound engines that have escapement, key-off, string resonance etc.? I mostly play classical so I’m after the best sound possible. And is their app for iOS only or Android too? About the Casio – is the keyboard so bad (soft) compared to others? Otherwise this would probably be my first choice. Unfortunately I don’t have a chance to try these in a shop so I’m left with advice from the Internet. Sorry for my English and thank you again for your hard work! I might add that in my country both the Yamaha and Casio cost the same $1,090 while the Roland is about $820. Hi Robin, first of all, my personal impression of the piano (especially when it comes to sound and touch) doesn’t mean that you should remove instruments from your list of contenders just based on that. 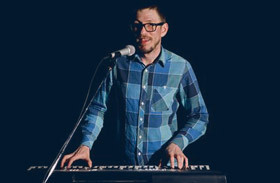 Also, could you please point out where I said that Casio has the softest keyboard action? I’d say it’s more medium weighted, not too heavy, by definitely not light! While all of these instruments (YDP-163, RP102, PX-870) have onboard speakers, the RP102 indeed has the least powerful ones…on paper. In practice, any of these instruments will probably give you more power than you’ll ever need in a home setting. So, it’s not a deal-breaker here, in my opinion. But it’s also true that more powerful speakers can be louder and a bit bolder (fuller) compared to less powerful ones. If you’re looking for the most powerful onboard speakers, the PX-870 might be a good choice, since it has 4-speaker 40W sound system (the YDP-163 has two speakers). Those elements of piano sound that you mentioned (key-off resonance, string resonance, etc.) are quite subtle but important if you want the most realistic experience possible. Chances are you won’t notice much difference at all in every day playing. But if you’re used to playing on an acoustic piano, you might want to have all those organic elements as they do make the experience more authentic. 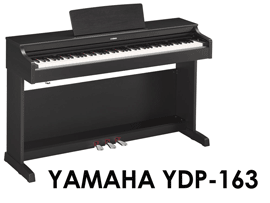 The Yamaha YDP-163 is very decent option to consider, it’s just in the US the price is much higher than in Europe (as well as the price difference between the YDP-143 and YDP-163), and in my opinion there’re just better options available for the same money or less. But if in your country the price of the YDP-163 is comparable to the Casio PX-870, Roland RP102, Kawai KDP110, it definitely would be a good option to add to your list. I enjoy your reviews a lot. Yamaha YDP-163, does this comes with a sliding cover? It does! The YDP-163 comes with a built-in sliding cover. Pretty much all furniture-style digital pianos will have it.